antique ottoman silver, MAKEDONIAN OR ALBANIAN . PENDANT COPER, CHAIN SILVER. 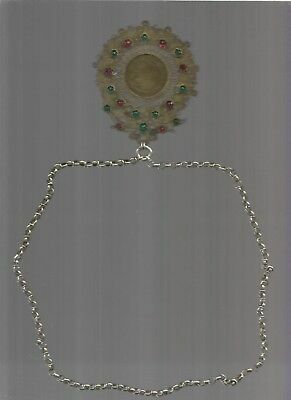 Seller: alb_antiques (74) 100%, Location: Durres, Ships to: Worldwide, Item: 223453927901 ANTIQUE OTTOMAN 19 c. MAKEDONIAN OR ALBANIAN PENDANT COPER WITH MERCUR TECNOLOGY THE CHAIN SILVER complet 80 Gr. Seller - 74+ items sold. 0% negative feedback. Great seller with very good positive feedback and over 50 ratings. 74+ items sold. 0% negative feedback. Great seller with very good positive feedback and over 50 ratings.